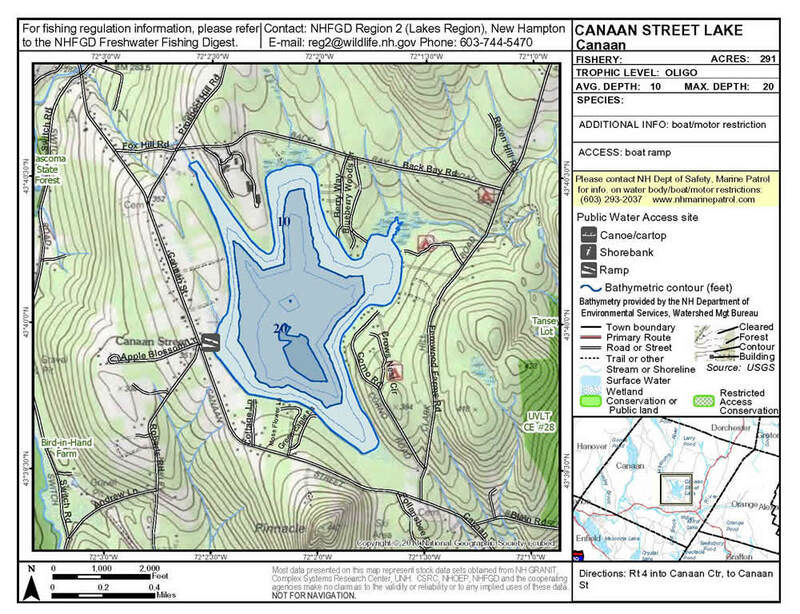 Canaan Street Lake is 303 acres (123ha), shallow and largely spring fed. The lake's importance to Canaan Town has several aspects: It is the only water source to downtown Canaan and should it become unavailable, replacement with wells would be expensive; it is a recreational asset with a public beach and boat ramp; it is an asset to lake-side owners, a fact acknowledged by an increased town tax base. RSA 270:113 - No person shall use or operate a Skicraft as defined in RSA 270:73 V, or a hovercraft as defined in RSA 270:2, VIII, on Canaan Street Lake. The south end of the Lake is a Public Water Supply. In the summer this is marked by buoys. No boat entry is allowed in the Public Water Supply. The two primary uses for Canaan Street Lake are for recreation and for drinking water for Canaan Village. While related, the water quality concerns for each are somewhat different. 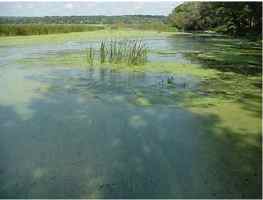 The greatest threat to lake recreation is an invasive aquatic weed called milfoil. This is transported by clinging to boats moving from infected lakes to our lake. 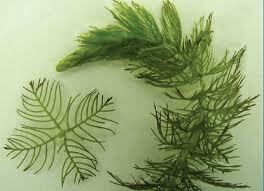 The nearest milfoil infestations are Mascoma Lake in Enfield and Post Pond in Lyme. Should this become established in our lake, control is very expensive, and it is nearly impossible to eradicate. Swimming, fishing, and boating can become unattractive and eventually impossible. Learn more about NH Exotic Species by clicking here. Milfoil is best controlled by removing foreign matter from boats and trailers, and when possible, washing and drying boats and trailers. The Lake Host program strives to achieve these goals, and educate the public. The next threat of concern is phosphorous and it applies to both drinking water and recreation. This comes from many sources including fertilizer, septic systems, waterfowl feces, stormwater runoff, lake sediments, lawns, and decaying plant matter. Too much phosphorous will lead to murky water and aggressive plant growth. More importantly it can cause blooms of toxic blue-green algae, which could close the village water supply and prohibit swimming. The impact of phosphorous accumulates over many years, unlike milfoil which can have disastrous effects in a few years. Phosphorous can be minimized with septic maintenance, zero phosphorous fertilizer, shrubs placed between lawn and lake, and stormwater containment. 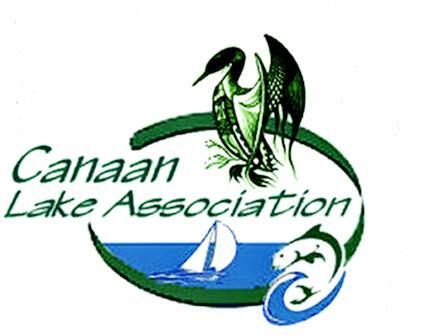 The Canaan Lake Association helps to maintain two important programs for lake health, the Lake Hosting Program and the Weed Watchers Program. In addition, the Canaan Source Water Protection Committee helps to advocate for the quality of Canaan Street Lake. 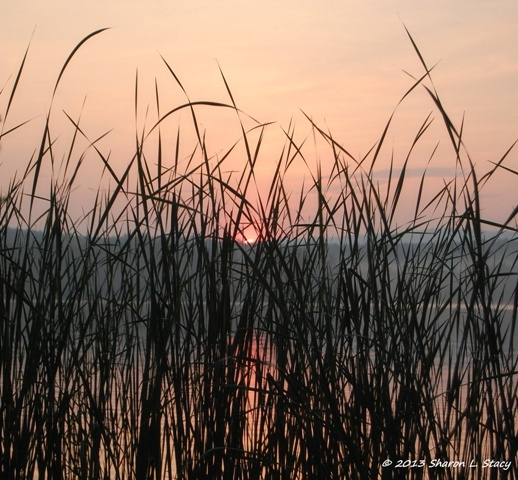 Several projects in which they have participated, the Canaan Street Lake Watershed Protection Plan and the Land Use Recommendations for Protecting Canaan Street Water Quality, and the Lake Monitoring Program Report have resulted in bettering the local lake and community. Thirdly, the Canaan Lake Association does water quality monitoring in conjunction with the NH DES Volunteer Lake Assessment Program (VLAP). The state provides the equipment and the Lake Association provides volunteer labor and pays for laboratory water tests. NH DES provides labor and laboratory services to periodically test the town beach water for harmful bacteria and toxins. The summary of the latest results of these programs is available in the NH VLAP Report on Canaan Street Lake. Pleease see How to Read Your Report for an explanation of the NH VLAP report. On the state level, the NH Department of Environmental Services Water Division regulates and protects with a myriad of programs. Their site listing of programs and publications is an invaluable resource to everyone.